A rare, monumental, and beautiful 1876 or Meiji 9 Map of Japan. Oriented to the west, this beautifully engraved map covers the Japanese islands of Honshu, Shikoku and Kyushu, with parts of adjacent Hokkaido and Korea. Color coded according to geographical region. Smaller tables in the lower left and right quadrants provide supplementary information, such as telegraph distances. 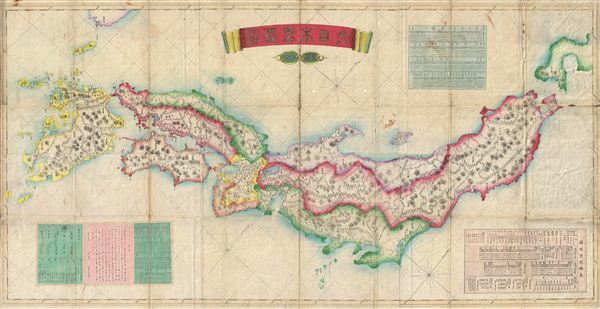 This map was issued early in the Meiji Restoration and as a transitional piece exhibits aspects of both traditional Japanese and the european cartographic elements. Very good condition. Attached to original boards. Minor wormholing - see image. Minor wear and toning on original fold lines.